Bubble Tea is a Taiwanese invention said to have originated in the 80’s at a well-known tea stand. Randomly, some flavor was shaken into tea, the bubbles that formed with the shake essentially named the drink. Milk tea was already quite common, so adding sweet flavors became a new way to enjoy it. Tapioca pearls came next, which had just been introduced to Taiwan, and were heavily used in desserts and sweet delicacies. It was only a matter of time before they made their way into the sweet, dessert-like milk tea concoction. Adding fresh mango, coconut milk and local honey, as we do in this version, reimagines this sugary drink into a lighter, more tropical forward and naturally-refreshing beverage. We use Earl Grey, which seems lighter and therefore contributes to greater refreshing qualities; not to mention the slightly perfumed essence of the Earl Grey mingles perfectly with mangoes, and encourages their perfumed qualities to pop. 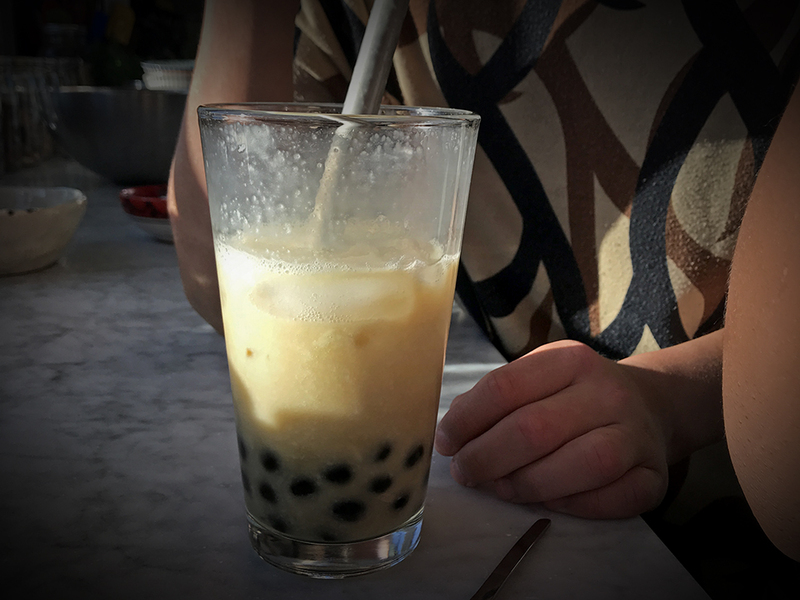 The chewy tapioca pearls give the drink something to chew on! You can use any black tea and milk of choice; coconut, almond, oat, regular. Make the Mango Pit Honey Nectar. Cook the tapioca pearls by bringing water to a boil. (Always use at least 8 times as much water as there are tapioca pearls for best results.) Gently add the tapioca pearls and cook for about 25 minutes on a medium high – gently rolling boil. Strain the tapioca and add them to 1 cup of Mango Pit Honey Nectar in a medium mixing bowl. Stir gently, making sure the tapioca pearls get smothered in the nectar. Let rest for 30 minutes, unrefrigerated. Combine the fresh mango, the remaining ½ cup mango nectar, the coconut milk and water in a blender and blend until totally smooth and all ingredients are blended together. This mixture can be chilled and refrigerated no longer than 10 days for optimal flavor and freshness. Place about ¼ – 2/3 cup of cooked tapioca pearls with nectar in a large glass (wide mouthed glasses are best), and pour about ½ cup steeped tea over the top, followed by about ¾ cup of the mango coconut mixture. Add a few ice cubes and stir. Use a wide (sustainable) straw or a spoon to get to the chewy tapioca!